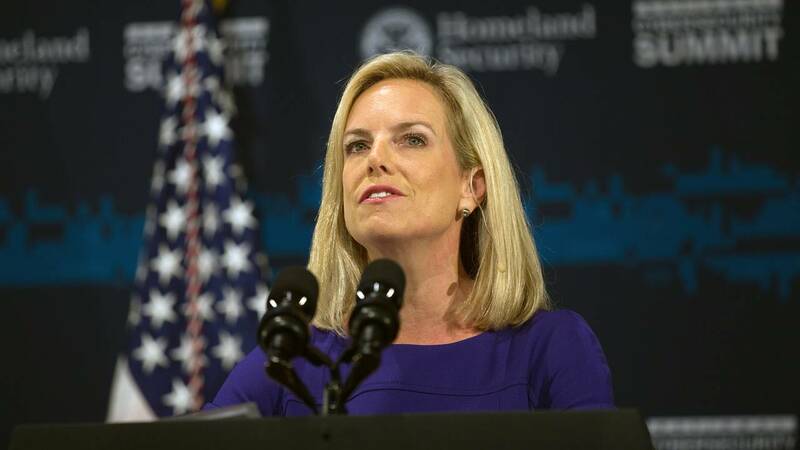 U.S. Department of Homeland Security Secretary Kirstjen Nielsen speaks during the Department of Homeland Security's Cybersecurity Summit on July 31, 2018 in New York City. WASHINGTON (CNN) - A Justice Department employee who heckled DHS Secretary Kirstjen Nielsen at a Washington restaurant and criticized the administration's immigration policy online did not violate rules against political activity by government workers, a watchdog agency found. In a letter dated this week, the chief of the US Office of Special Counsel's Hatch Act Unit wrote that Allison Hrabar, the employee, had not violated the federal law dictating such acceptable political activity. In June, Hrabar was among a group of activists who protested Nielsen as she dined at the height of the family separation crisis at the border. On her Twitter account, Hrabar opined on Trump administration policies, making statements like "Keeping families together in jail is not an acceptable solution." "Advocating for or against policy matters, without more, does not constitute political activity," wrote Ana Galindo-Marrone, the Office of Special Counsel official. "The tweets we reviewed from June 19 and 20, which Ms. Hrabar posted while at work, only stated her views on immigration policy. Therefore, we have concluded that Ms. Hrabar did not violate the Hatch Act, and we are closing this matter without further action." The letter was provided to CNN by Ty Clevenger, the attorney who filed the complaint to the Hatch Act agency. His complaint centered on the tweets Hrabar had made while at work. An Office of Special Counsel official confirmed the authenticity of the letter. The Hatch Act prohibits employees from engaging in political activity while on duty, and defines unlawful actions as ones directed toward the success or failure of a political party, partisan political group or candidate for partisan political office, according to the Office of Special Counsel. The June showdown at a popular Mexican restaurant in Washington was caught on video and went viral, the shouts of "shame" and "end family separation" mirroring uproar across the country at the administration's "zero tolerance" immigration policy that was leading to the separation of children from their parents along the US-Mexico border. After the protest, Hrabar retweeted a video of Nielsen leaving the restaurant, adding, "No one who has ever made their living terrorizing immigrants deserves peace. If you see one in a restaurant, at a movie, or in your neighborhood, remind them of that." A Justice Department spokeswoman said Wednesday that the department declines to comment on personnel matters.